It Sounds like You, Dad and Acea are doing well and before I forget HAPPY BIRTHDAY ACEA you are old with 17 years that is just crazy. For the Christmas package you can stuff it full of candy and maple syrup extract, space is precious so please do fill it full of plastic shopping bags and declare the price really low so I doing have to pay 200 reals again. I will call you guys on Skype, but this time on Christmas probably at a member's house so that should be really good. Well I was transferred and I will end my mission in the wonderful city of Valinhos I am so excited to work here and we will have a lot of baptisms here in a little bit. The members here are pretty well off and they are ready to helps us in our work. 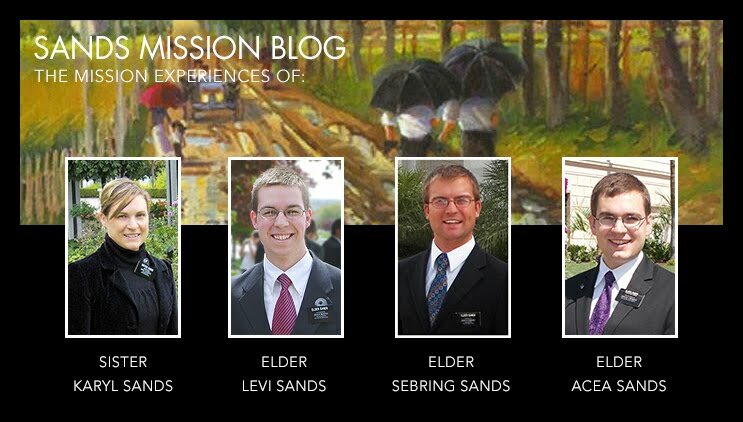 My new companion is Elder Conner from Salt Lake and He is wonderful, he is the first one of my companions while I was senior that works independently and that helps a lot. The Ward here is big, the biggest I have seen on my mission and we are having a lot of help from our ward mission leader. We are helping Igor a young man of 15 who has been to church a few times but his mom is not letting him get baptized just yet but will soon. There are a few part member families we are trying to visit that they too can be baptized. On Sunday a member brought a coworker at a great Ice cream store that the bishop owns. Congratulations Dad on your new calling; it would be really neat to talk with you in other wards. I will be transferred so for the next 4 months I will be able to get out of drinking a lot of soda because it is affecting my health for sure. I don't know where I am going or who my companion is I will find out tomorrow. I learned a lot in this area in Piracicaba 6 of really learning how to better use the members in fellowshipping and teaching, following up on investigators and being a lot more bold in contacting and teaching. It was tough, but I have seen the blessings and miracles occurring in many ways. It will be sad to say good bye to the members here but change is something you get used to on a mission. This last week there was a lot of good happening. This week a son of a investigator who is married to a less active member left prison, and he is also a member and this was how the Lord got this family to come back to church. A friend of a member named Alex went to church, that means that here soon he can be baptized and that makes us very excited. The English Class is getting a little bit bigger, but this week we got 500 professional flyers that we handed out all on Saturday so that should help out a lot getting the word out to the neighborhood. That is what is going on I will have more to report next week. Thanks for the work out tips, I will start doing that, and for a few days a week my companion and I have been running with some young men in the Ward and that has been helping. I think the main thing I need to cut back on in the Soda which we drink every day in the member's homes for Lunch, but I will watch more what I eat. This week has been a roller coaster, the week started out great where we taught a few people and follow up about how they like the church. Then came the rain, the great Brazilian rain that poured from the skies, and when it rains like that, we get soaked and it makes it hard to work. On Thursday was a sad day in where a member of the Church here named Joao had a heart attack and he died yesterday leaving two daughters and a 6 year old son. It was shocking and we all felt the sad atmosphere and today we went to the funeral. It is a good thing we understand the plan of salvation; that sting of death really is swallowed up in the atonement of Christ. This is the 5th person that I knew that has passed away while I have been on my mission and you can feel that comfort from the Spirit. We have been teaching the couple of lindomar e Selma and they have really been progressing, they didn't go to church yesterday because they had a fight and didn't feel right going to church, We have been seeing this for the past week but it is hard too because they are not marry yet, but we have been bringing many members with us, and the bishop, to help them out with these things and we plan on doing a family home evening to help them with their relationship. Transfers will be next week so we see if I will stay or go to finish my last part of the mission. I am glad that you got the videos and even though my English is pretty bad, I remember enough to help teach English. This week went well, we were able to find several great people and during an activity in the Ward we went door to door giving out pass along cards and members found a part member family that we didn't know lived in our area. The man is named Lindomar. He was baptized 5 years ago but his girlfriend is not and she really wanted to go to church. They need to get married, but we have been teaching them this last week and we brought the bishop and he gave them a ride to Church. She is really sincere to find out if this is really the true Church of Christ even though she was active in the Adventist of the seventh day Church a few years ago. They loved the church and what to come back. Really some times when things are tough and you're working, but you are not seeing the results we can do just one thing, Trust in the Lord for help and doing everything we can do and control and we will receive the Blessings. This Last week has been hot reaching temperatures of 107. That is pretty toasty, but Elder Lee has it way worse in Cuiaba with 120 degrees and that is normal.